Los Angeles, Calif. – No. 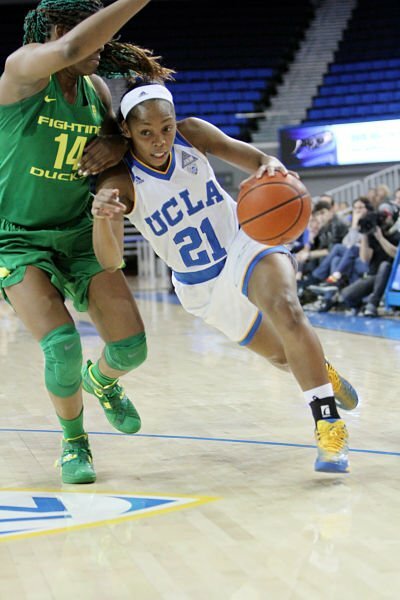 21 UCLA used strong defense down the stretch Saturday to run away from surging Oregon, 80-69. Nirra Fields lead the Bruins with a season-high 31 points, and Jordin Canada added 12 points and a career-high 11 assists. Jillian Alleyne headed up the Ducks’ efforts with 25 points and 16 rebounds, while Jacinta Vandenberg put up 12 points and grabbed eight rebounds. 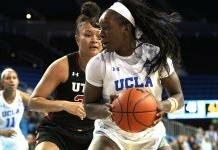 It was the second conference win for UCLA, which beat cross-town rival USC earlier in the week, and the first season loss for previously-undefeated Oregon. 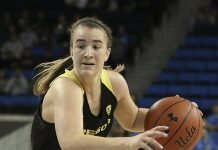 The game featured fast, physical play that has been representative of the entire Pac-12 this season, which has featured five ranked teams for most of the year so far. 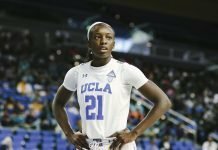 The Bruins got off to a fast start, despite the dominating inside presence of the All-Conference Alleyne, and they took an eight-point lead into the second quarter. But the Ducks capitalized on UCLA’s uncharacteristically low shooting percentage, both near and away from the rim, and closed the gap. They lead 39-35 at halftime, with Alleyne at 15 points and 9 rebounds, and Fields at 11 points. The third quarter belonged to the hosts, with guard Kari Korver exploding for a trio of three-point shots and Fields adding 9. They outscored Oregon 28-12 in the period. The Ducks made comeback attempts in the fourth quarter, but the Bruins’ defense kept them from getting closer than 8 points. UCLA shot only 32.4 percent, but outrebounded Oregon 45-35 and had five players in double figures. Bruin coach Cori Close attributed the win to increased defensive effort. Close was pleased with UCLA’s total team effort. Close said she was also impressed that when the Bruin offense was stutter-stepping, that it didn’t effect their defense. 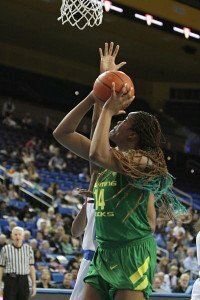 Alleyne said that Oregon, which has eight new players on the roster this season, lost focus in the second half. Ducks coach Kelly Graves said his team “hasn’t really been challenged much” this season, and that the game against UCLA was a good barometer for their progress. “I’m more encouraged than discouraged,” he said. Besides UCLA, Oregon State, Stanford, California and Ariona State have been ranked in the top 25 for most of the season so far, making the Pac-12 one of the nation’s tougher conferences. Both Ducks and Bruins acknowledged that every game now will be a dog fight. “It’s going to come down to which team wants it more, because any given night, any team can win,” Alleyne said. “Rankings don’t matter right now because this conference is so strong. It’s going to come down to who wants it more, and what team is really going to give more when we reach midseason and everyone’s tired and worn down. UCLA will face No. 10 Oregon State Monday, and Close said her team will prepare in the same way that it did for Oregon. “It used to be that you’d have to get up for these big games, but they’re all so big now, because the balance is such that I don’t feel any differently about Monday’s game than I did about today’s game,” Close said. Oregon plays USC Monday, whom the Beavers routed Saturday.